The NRC recently marked a milestone with the transition of the Browns Ferry nuclear power plant to the National Fire Protection Association’s Standard 805 (NFPA 805). The license amendment, issued October 28, is significant because it marks 23 reactors at 15 plants to have completed the transition since 2010. It is symbolically important because a fire at Browns Ferry in March of 1975 prompted the NRC and the industry to focus on fire safety at nuclear power plants. The Browns Ferry fire started when a worker used a candle to test airflow around a temporary penetration seal in the cable spreading room. The flame ignited the temporary seal material, and the fire spread to the reactor building where it burned many of the cables in systems required to safely shut down the plant. Although plant operators were able to shut the plant down safely, the event led the NRC to promulgate prescriptive fire safety requirements (10 CFR Part 50, Appendix R). For example, plants were to ensure there was at least 20 feet of separation between trains of redundant safety systems. However, this requirement was impractical for some plants that had already been built, so in many cases licensees had to find an alternative means of achieving an equivalent level of safety. 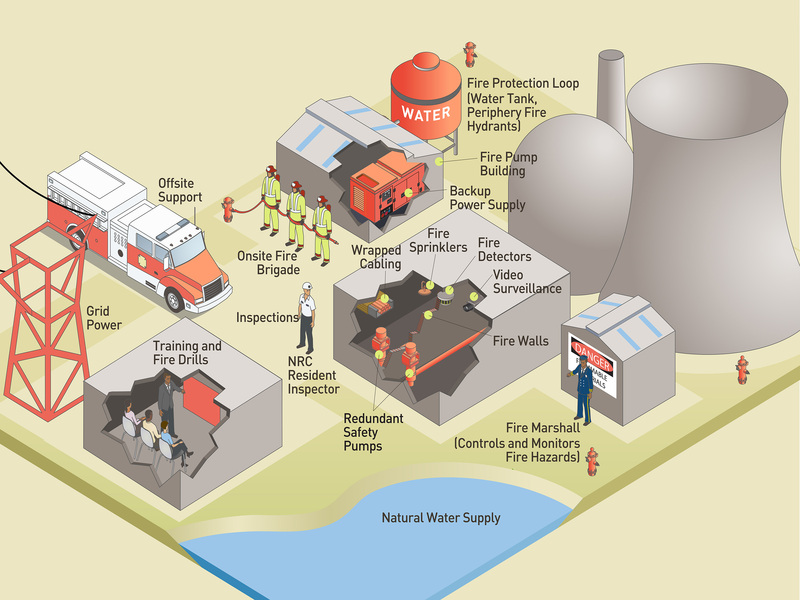 The NFPA 805 is a performance-based means of using advanced fire analysis tools to assess the risk of fire at various areas of a nuclear power plant. That way, a plant’s fire protection scheme can be customized to focus on the most risk-significant areas and to protect the reactor’s safety systems. Using the NFPA 805 standard is optional. Newer plants constructed after 1975 were typically built to the prescriptive requirements. So they may opt to remain under those requirements, contained in 10 CFR 50.48 and still be in compliance with the agency’s fire protection regulations. Although NFPA 805 offers certain advantages from a risk-informed perspective, both methods provide reasonable assurance that a plant would be able to cope with a serious fire. The following plants have now completed the transition to the NFPA 805 fire protection standard: Shearon Harris; Oconee 1, 2 & 3; D.C. Cook 1&2; Duane Arnold; Callaway; Fort Calhoun; V.C. Summer; Cooper; Nine Mile Point 1; Turkey Point 3 & 4; Farley 1 & 2; Brunswick 1 & 2; Palisades; Arkansas Nuclear One Unit 2; and Browns Ferry 1, 2 & 3.